Roel's World Blog » ⚠ Myth: Mozart, Jimi Hendrix, Bob Marley, Price ... 432-Artists? ⚠ MYTH: MOZART, JIMI HENDRIX, BOB MARLEY, PRINCE … 432-ARTISTS? From time to time stories about various known artist and composers such as Bach, Mozart, Verdi, and more recent Bob Marley, Jimi Hendrix and others pop up, with claims that these artists and composers wrote and/or performed music for concert pitch 432 and/or 432-tuning. Unfortunately most of these stories are rather “speculative” … are those stories urban legends or … ? For information about Giuseppe Verdi read this article! Q: Have the proclaimed “432 artists” and composers mentioned or noted anything themselves about using 432-Tuning? A: In short, No (although both Verdi and Prince seem to have referred to 432Hz as reference pitch once). Most articles with these stories generally fail to provide proper references that support their claims. There are no links to interviews or documentaries nor to articles, autobiographies or memoirs by the artists in question themselves, sharing any information about the usage 432Hz as Concert Pitch and/or another Temperament then the present standard. Q: Did the proclaimed “432 artists” and composers (always) compose for and/or perform their work using Concert Pitch A4=432Hz? A: In short, No. I have not been able to find proper historical data (logs et cetera) about any artists and composer mentioned above of using A4=432Hz for (all) compositions. Perhaps the particular historical data has not been made “public”, but that would be odd, wouldn’t it? It is though rather strange (if not questionable) why some people proclaim composers did compose in 432, but can not deliver any proper historical evidence to proof their claim. Where is the hard evidence that proves their claims? We do know that great composers – Mozart being one of them – traveled a lot (not only through all German-spoken countries, but in England, France and Italy as well) and must have come across various concert pitches used by musicians, orchestras, instrument builders and composers locally. A composer – when asked to compose a piece – had no other choice then to compose for and work with instruments with the pitch locally used. Naturally the choice of instruments used for a piece would influence the possibility and flexibility of tuning as well. A string quartet would be able to use a large range of possible concert pitches and temperaments, while a church organ would only work with the particular concert pitch it was designed for. Various people have noticed that some mostly older recordings sometimes do sound a (little) bit lower (or higher) in pitch then 440Hz. Nowadays most artists record digitally, but a couple of decades ago all artist would record on tape. The “problem” with tape is that in time – when played often – tape could “stretch”. A direct result of tapes getting stretched out is that the pitch (and tempo) of a piece would drop a little. Another thing that we should keep in mind, is that the tape decks used had electrical (mechanical) motors to spin the tapes, that like any mechanical part got “worn-out” in time. Fluctuations / changes in pitch when using tape was there for not uncommon. Even using the same tapes on different tape-decks could result in a variation of pitch (and tempo). Another important thing to keep in mind is that not all instruments can change Concert Pitch. If also the Temperament needs to be changed, then some instruments like the guitar will be problematic. Almost all guitars and bass guitars have a 12-Tone Equal Tempered fret-board. Trombone is pretty much the only wind instrument that could play in any Concert Pitch and Temperament. Fretless String instruments have (generally) no problems with changing the Concert Pitch. Most drum/percussion instruments – in particular membranophones – can be re-tuned. But some drum/percussion instruments – for example cow-bells – can not tunable, they are manufactured for a particular pitch. Modern synthesizers have micro-tonal features that make it possible to change pitch and/or temperament. Older keyboards and synthesizers did not (always) come with these features. Some instruments were designed to be played in 440Hz are for example: Fender Rhodes, Hammond Organ, Vibraphone and conical wind instruments like the Saxophone. If you see these instruments (original) on stage, then you can bet on it that the band is playing in 440Hz. When instruments that can’t change their pitch from 440Hz to 432Hz, then you can be pretty sure the recordings made and performances given were NOT with the use of Concert Pitch 432Hz. More information about the Concert Pitch and Temperament capabilities of instruments can be read in the article “Instruments & Tuning“. The dates of the “Classical Period” are generally accepted as being between about 1730 and 1820. The “Classical period” falls between the Baroque and the Romantic periods. The among best-known composers of this period are Mozart and Beethoven. 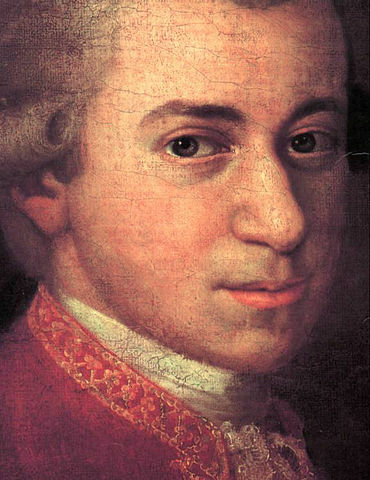 In Wolfgang Amadeus Mozart‘s time there was still no standard concert pitch. From country to country and even from region to region and city to city the concert pitch used could vary. The instruments used by musicians and the concert pitch they were build for would differ as well. Some instruments, like string instruments, could be tuned easily to a different concert pitch. Other instruments, like Church (pitchpipe) Organs would not have this possibility. You can find more information about instruments and their tuning capabilities here. Some people have told me (through e-mail) that they have seen an authentic score from the hands of some of the great composers (like Mozart) with “A=432” written in the side-line. This might be very true (I have no reason to doubt the writers intentions). But this “evidence” has not been shared in public, so I can not deny nor confirm it’s authenticity. If it is true, why hasn’t anyone one else (then the specific individuals) have ever seen it? And why do these individuals do not share their evidence? This is maybe the most mentioned artist of “our time” in relation to 432-tuning. It seems though, that this claim is not based of facts, but the result of misinterpretation and perhaps mostly “wishful thinking”. So, why do some people proclaim Bob Marley to be a 432-artist? The most important reason though why Bob Marley did not record and perform in 432Hz (as far as is know), is the instruments used by his band members. In many pieces of Bob Marley instruments like a Fender Rhodes (an instrument that was build for 440Hz and has no microtonal capabilities) or an original Hammond Organ is used (some sources say a change in the power frequency could effect the pitch because the motor is speed locked to it, but this I can’t say for sure). On some of his albums and at some live performances a horn section participates. In particular when a saxophone is used (conical wind instrument), there will be intonation issues if Concert Pitch 432Hz is used instead of the Concert Pitch the instrument was build for (440Hz for most brands). With other words, when using such instruments, you have no other choice then to record (and perform) using 440Hz as concert pitch. IF Bob Marley was a 432 composer/musician, would it then not be more logical if he would perform in 432Hz as well? Why then, was 440Hz used during all the live registrations? In some articles Jimi Hendrix is mentioned of using 432Hz. Similar as with Bob Marley the recording method and medium used does play a role in various pitch differences detected by listeners. Hendrix, like Marley, used 12-TET guitars. Often musicians have to re-tune their instruments in between pieces during a concert. Changes of temperature and even amount of moisture can detune instruments. Strings also lose tension (drop in pitch) as well due to the striking/plucking. The amount of force that the strings of guitars are stroke or plucked with is much higher with Rock music then with many other music styles. Another reason why Jimi Hendrix – and for that matter many other rock artists – could sometimes sound a bit “off-pitch” – in particular in live-recordings – is that many rock artists tuned by ear. A classic rock formation (with vocals, guitars, bass and drums) is not bound by Concert Pitch (only by Temperament), unlike Rock bands that also used keys (for example Hammond Organ). That Jimi Hendrix tuned his guitars different then most guitarists is fact though. He was one of the most known guitarists that used the so called “E♭ (E‐flat) tuning or D♯ (D‐sharp) tuning“. All of the strings are lowered by one semitone (100 cents). This is where the present A4=440Hz pitch standard and the “Baroque Pitch” of A4=415Hz come together (the difference between 440Hz and 415Hz is 101 cents). Using A4=415Hz instead of A4=440Hz does NOT really change anything though. The tone frequencies used with 440Hz as Concert Pitch are being used in both cases. You could say that all tone-names simply “shift” a semitone. A4 is no longer 440Hz, but A#/Bb is now. The reason why various guitarists tuned this way are a heavier tone / change of timbre, the possibility to use of heavier strings without decreasing playability and/or greater string flexibility (for legato and bending) without losing compatibility with 440Hz tuned instruments. Jimi Hendrix is known for using Eb-Tuning, not 432-Tuning. To end this article with something positive (specially for those who are disappointed after reading this article) … According to various articles Price has shown an interest in the 432Hz topic. In order to promote a new album release, he offered a rare engagement with his fans via Facebook on September 30, 2014. That post is not available on Facebook though, nor is the Prince page in question active. Who Dee J Fogee exactly is I don’t know, the website deejfogee.org is down (at least it was when I added this info) and the last post on the Facebook profile of Dee J Fogee was done on 5 December 2015. Here you can find the article linked to: “Here’s Why You Should Consider Converting Your Music To A=432 Hz“. Is it clear why Prince decided to post that link? How did he really feel about it? Was he serious or just creating a bit more “Controversy”? Was that post really made by Prince himself? At prince.org (the online fan community) fans are not sure what to think about it as you can read in “Q&A with Prince on Facebook today!” and “The frequency of A-432hz“. Prince himself did not share any more thoughts or insights on this topic after that Facebook Q&A event. And we might never know the “truth” about this story, Price passed away on the 21th of April 2016. The albums he made – including those released after that Facebook posts – are not tuned to 432Hz, nor did he perform using 432Hz as concert pitch. For his music he used the standard 440Hz! Many (recording) artists and composers leave unfinished and unreleased work behind when they die. Often work they were not completely satisfied about yet or had not found the right moment for to release it. Perhaps in the near future some 432Hz tuned pieces pop-up from his “vault”, who knows. But, for the time being there is no evidence nor proper reason to proclaim Prince used 432Hz for his music. You might have come across videos of famous artists and bands such as Bob Marley, Jimi Hendrix, Pink Floyd, Enya, Coldplay, The Doors, John Lennon / The Beatles, Dire Straits, Jamiroqui … and many more that are available tuned to 432Hz. Important to keep in mind, is that those pieces were not uploaded by the bands, their management or label, but by fans of their music. These fans have down-pitched their music before uploading it onto Youtube.
! Only 432-tuned tracks available through the official Youtube Channel of artists/bands and/or their label are authentic. All other are not official (proper) representations of the works by those artists. Home » Blog » 432 Tuning » Blog » ⚠ Myth: Mozart, Jimi Hendrix, Bob Marley, Price … 432-Artists?